Vanessa Kenoyer stopped by San Francisco’s Grace Cathedral last summer, curious to check out an art exhibit she’d heard about. She lives three hours away, in Northern California’s mountainous Lake County, and on her occasional trips to the city, she likes to go to art galleries and soak up some of the city’s urban culture. However, walking into Grace Cathedral, she found something even more profound -- a connection with the divine. An intricate labyrinth is inlaid in the floor of the cathedral. “It instantly just caught my breath,” she says. Labyrinths have always been special to Kenoyer. To her, they represent a journey that all humans go through and can be found across cultures and continents. This symbol of the labyrinth is so special to Kenoyer that she had it tattooed on the back of her neck, like a subconscious guide to her path in life. 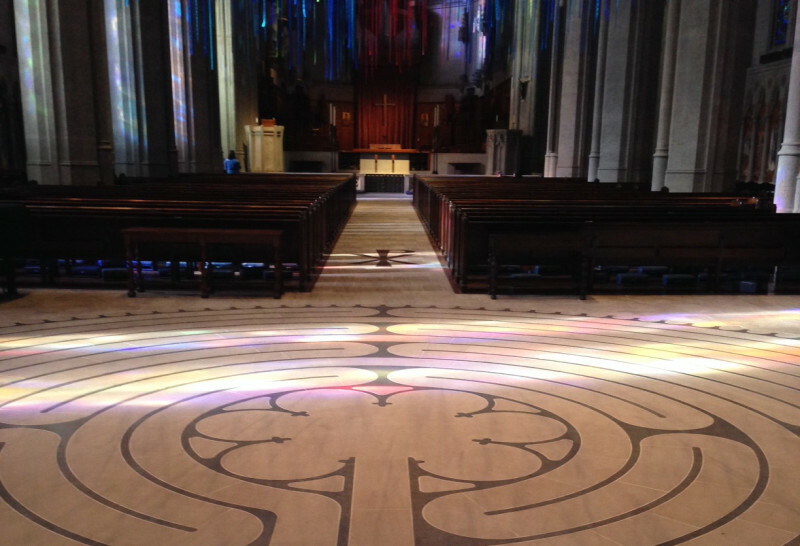 When she comes to San Francisco, Kenoyer makes a point to visit Grace Cathedral and walk the labyrinth, feeling this human pattern of interconnection. “It’s just something you start to drop into and this magic starts to happen. Some people start at the beginning of the labyrinth, and it’s fun to watch them. Some people just jump right in,” she says. For Kenoyer, even though she is not Christian, the cathedral is a special place full of light and spirit. “You can always feel when you walk into a place that is special, of people’s invocation of the divine, no matter what your faith is or what your path is," she says. "When it’s set aside, you can just feel it when you walk inside. And this is one of those places."